Well… I saw my first robin a couple of days ago, the final red-breasted nail in the coffin of the winter that wasn’t. 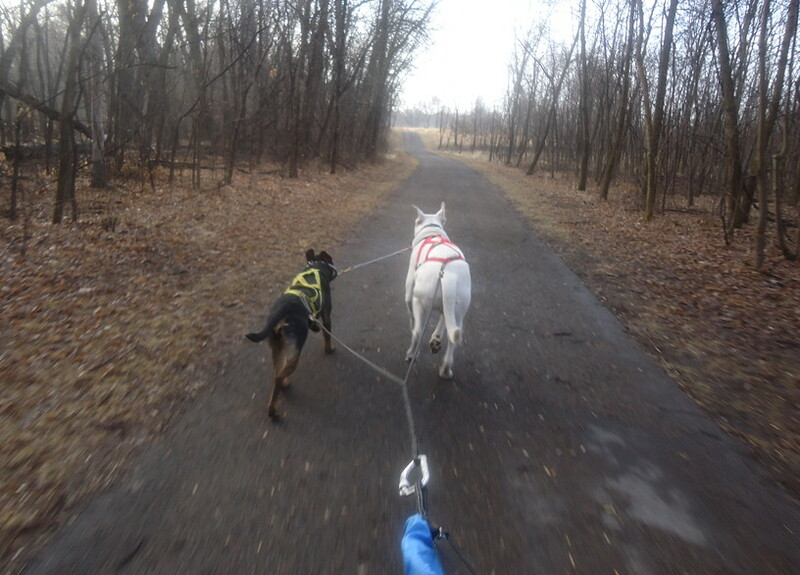 But at least the trails are finally completely clear of ice and snow, so when I leaned over and whispered “scooter” in Squash’s ear this morning I really, really meant it although I was mostly goofing off. I didn’t realize he really knew the word and I didn’t realize how happy it made him, so I was surprised but pleased when he went completely bonkers. He likes it, he REALLY likes it! There is a little group of adjacent and partially connected little mini-parking lots at the park where we scooter. 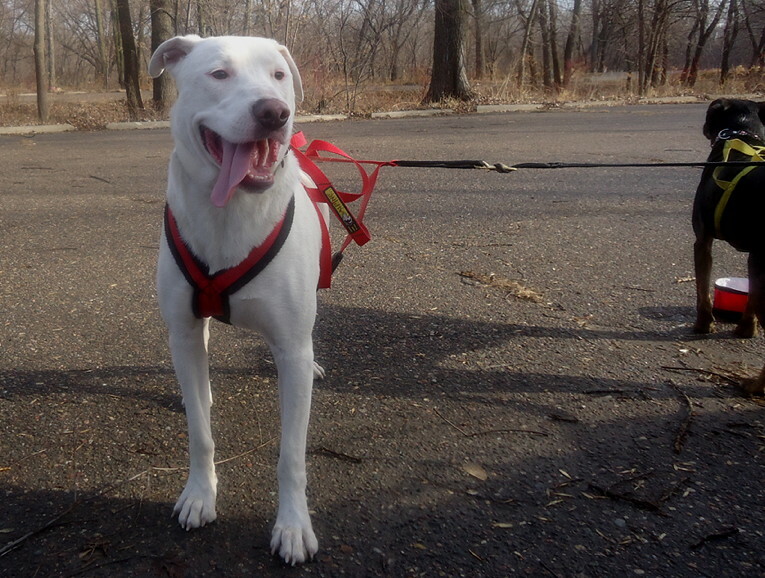 Even though I prefer to run the dogs on soft surfaces, I don’t mind pavement for short runs or parts of runs and for training commands. So the plan for today was to use these little parking lots to do some Gee-Haw practice. We did pretty well, I think. 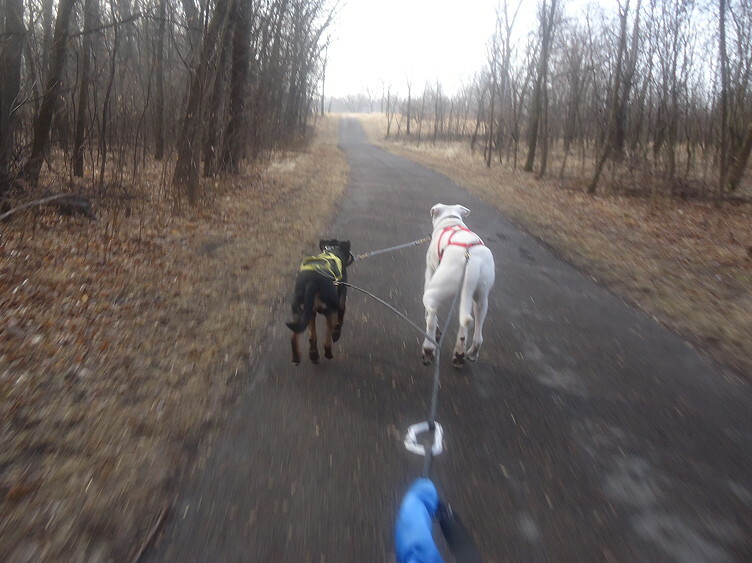 We did three short runs like that before moving on to a nice longer run mostly through the woods, which was a good workout for them as the ground is still quite wet and soft. I also switched to a shorter neckline which I was extremely happy with. Tangles with the neckline have been a frustration for me but for some reason I can’t remember I had been reluctant to use the shorter one. Call me reluctant no more. a small group of deer walked across the path at the crest of that small hill ahead of us. 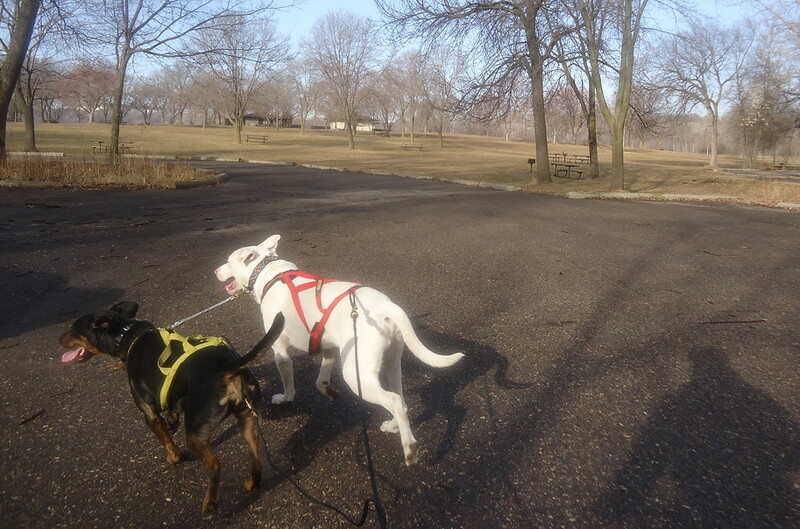 Normally, I help the dogs up hills by either kicking or hopping off and running beside the scooter, but their eyes and brains were full of deer and they rocketed up that hill like Popeye on spinach. It was amazing and exhilarating but slightly frightening, and once at the top they wanted to shoot off into the woods instead of staying on the path. We ended up at an impasse on the top of the hill, with them lined out like a compass pointing towards the true north of the retreating deer and me leaning back like some kind of bizarre half-woman, half-scooter counterbalancing cyborg. Obviously I came out ahead in the end or I would still be searching through the woods for my wayward beasts, but for a few minutes at least the outcome wasn’t certain. And my happy, tired boy ready to go home after a cool down and water break, ready to rest up until the next time I whisper “scooter” in his ear.